Chief Minister Naveen Patnaik today flagged off the intra-state flight service offered by chartered carrier Air Odisha connecting three destinations in the state. On its inaugural journey, the carrier took off to Sambalpur from Biju Patnaik International Airport (BPIA) here and would return to Bhubaneswar via Jharsuguda. The inauguration ceremony was held at the hangar of the old terminal of the airport at 11.15 am. Air Odisha Aviation Pvt Ltd will begin flight service to Jeypore, Rourkela and Jharsuguda from Thursday, sources said. It may be mentioned that the nine-seater plane has the capacity fly 11 passengers, including a pilot and co-pilot. 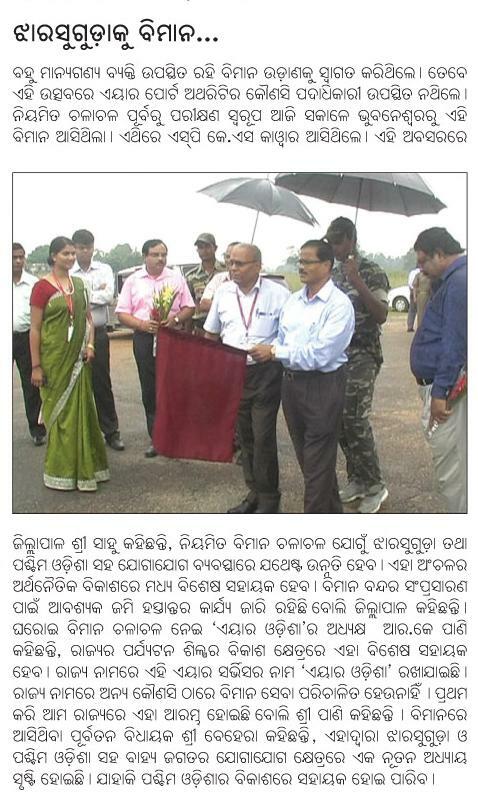 Earlier, the airlines had conducted trial runs to four cities – Sambalpur, Jeypore, Jharsuguda and Rourkela. The service will be available six days a week except on Sundays. The Bhubaneswar-based private carrier is offering tickets as low as Rs 2,499 as inaurugal offer. It may be mentioned that the Director General of Civil Aviation (DGCA), in December last year, had given a go-ahead to the air operator to fly intra-state commercial flights after clearing the on-board airworthiness tests. Air Odisha Aviation Friday launched commercial flights between capital Bhubaneswar and important industrial hubs in the state on an experimental basis, a senior company official said. The service was flagged off by state Tourism and Culture Minister Maheswar Mohanty at a simple function at the Biju Patnaik Airport of Bhubaneswar. In the first phase, the Odisha-based private company has introduced flights to Rourkela and Jharsuguda. Subsequently, it will extend the service to other important towns in the state, the official told IANS. 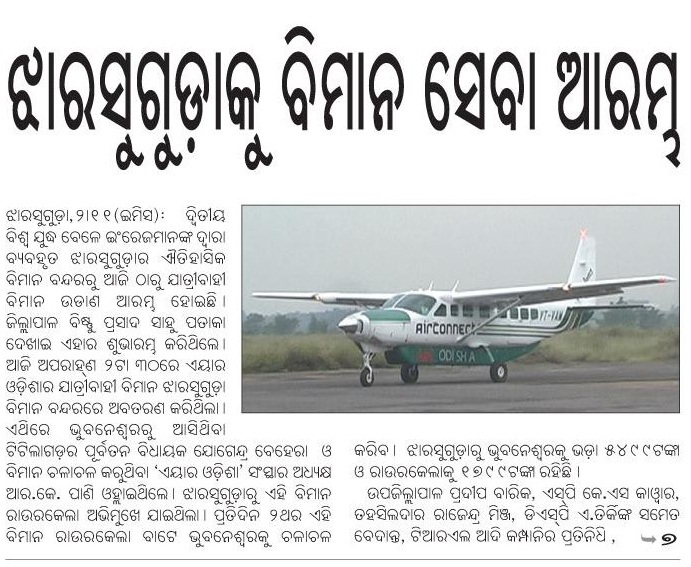 The flying time of the nine-seater aircraft from Bhubaneswar to Rourkela via Jharsuguda will be about an hour and a half. Rourkela and Jharsuguda are located at the distance of about 514 and 374 km from the state capital respectively. The state government led by Chief Minister Naveen Patnaik is keen on improving intra-state, inter-state and international air connectivity to meet the growth challenges in future. It is planning to develop at least five greenfield airports, including at upcoming industrial centres like Paradip, Dhamra, Angul, Kalinganagar and Rayagada. Moreover, it has proposed to upgrade existing airstrips at Gopalpur, Jharsuguda, Jeypore, Barbil and Rourkela. Air Odisha Aviation Pvt Ltd has firmed up plans to start commercial flights between Bhubaneswar and important industrial hubs of the State and select tourist draws in eastern India. The company has proposed to start the operation during the first week of October if everything goes as per the schedule, said Air Odisha sources. ‘’The company has already obtained the no objection certificate from the Directorate General of Civil Aviation for running non-scheduled air operations,’’ the sources said. The company has sought waiver of ground charges for use of airstrips managed by the Government. It has also suggested that aviation turbine fuel (ATF), used by aircraft, needs to be tax free to ensure that air travel is economically viable for tourists. “It has been decided to start seven days operation from Bhubaneswar to some select regions of the State. Connectivity to Kolkata will be available for three days and connectivity to Raipur and Nuapada for same number of days,” the company sources said. Connectivity to Kolkata will be via Jharsuguda and Rourkela. Capacity enhancement will be based on demand. The company has also proposed to provide air link to Jeypore, Vizag and Barbil in its second phase of operation. Making a review of the progress at a high- level meeting here on Friday, Chief Secretary BK Patnaik advised Air Odisha to start first phase operation from Bhubaneswar to Jharsuguda, Rourkela, Angul, Raipur and Nuapada. Flying time estimate shows that total flying time from Bhubaneswar to Jharsuguda will be an hour with additional 15 minutes on ground. Similarly, flying time from Bhubaneswar to Rourkela will be an hour and from Bhubaneswar to Angul 30 minutes with additional 15 minutes on ground for upward flights. For downward flights from these places to Bhubaneswar, the time on ground will be 30 minutes. The company plans to start its operations with a nine-seater. 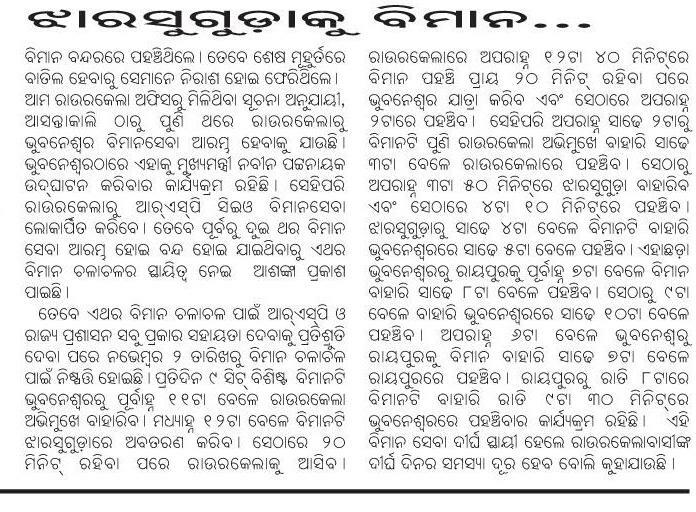 Air Odisha is also looking beyond the State. It is eyeing destinations like Vizag, Kolkata, Ranchi, Raipur, Jamshedpur, Tirupati and Shirdi after procuring a 19- seater aircraft. Initially, it will offer connectivity between the City and places of industrial activities like Rourkela, Jharsuguda and Jeypore. Mine-rich locations like Barbil and Angul also figure on the company’s radar and operations to these places will be introduced depending on viability, the sources said. Flight operations to Shirdi and Tirupati are expected to begin by December, said a company official. The non-scheduled air transport services are expected to boost industrial, tourism and business activities in the State. Air Odisha Aviation Pvt Ltd, a company floated by Odia entrepreneurs, has firmed up plans to start commercial flight operations connecting Bhubaneswar with important industrial hubs in the state and also with select destinations of tourist importance in eastern India. The company looks to start its operations with a nine-seater, no-frills carrier from September this year. Initially, it will offer connectivity between the city and places of industrial activity like Rourkela, Jharsuguda and Jeypore. Mine rich locations like Barbil and Angul also figure on the company’s radar and operations to these places will be introduced depending on viability. 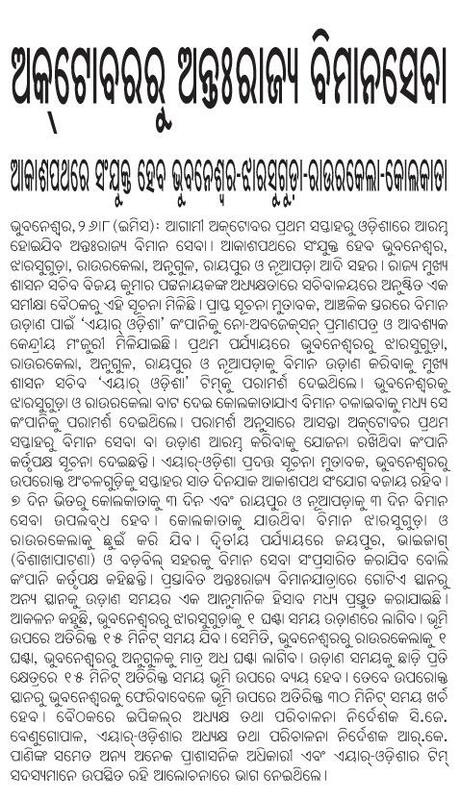 Air Odisha is also looking beyond the state. It is eyeing destinations like Vishakhapatnam, Kolkata, Ranchi, Raipur, Jamshedpur, Tirupati and Shirdi after procuring a 19-seater aircraft. “The fare would range from Rs 4000-6000 per head for travel within the state and also to eastern India cities. For Shirdi and Tirupati, we would charge Rs 12,000. Flight operations to Shirdi are expected to begin by December this year,” said a company official. “We have already obtained the no objection certificate from the Directorate General of Civil Aviation for running non-scheduled air operations,” he added. The company has sought waiver of ground charges for use of airstrips managed by the government. It has also suggested that aviation turbine fuel (ATF) to be used by aircrafts need to be tax free to ensure that it is economically viable for tourists to travel by air. A tie-up between two firms has put Jamshedpur back on the map of air transportation with the maiden service being run to and from Kolkata. Bangalore-based DTDS Travel and Tour Planners Private Limited joined hands with Spirit Air with the ventures first flight to Kolkata taking off on Monday at Sonari Airport. The company will also start Jamshedpur-Patna air services. 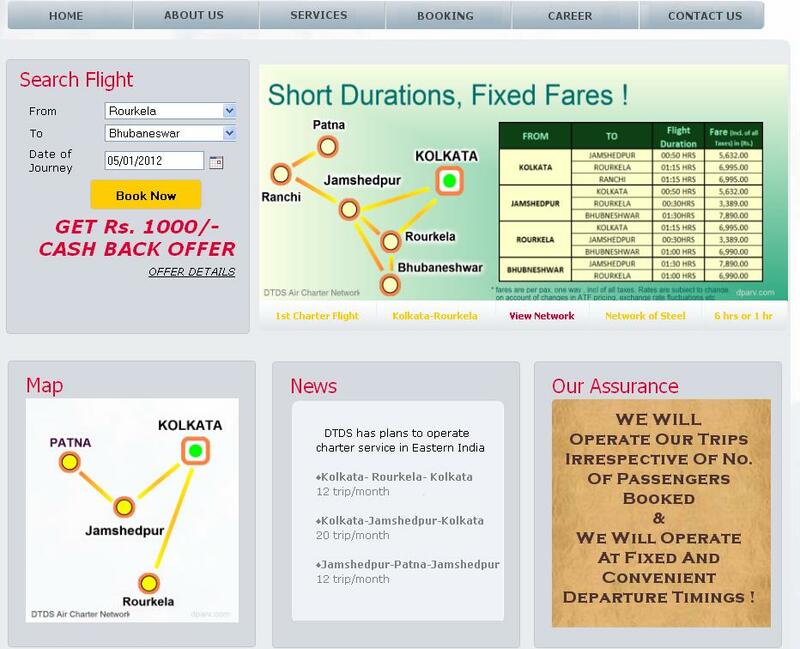 DTDS launched “per seat” air charter services to industrial cities from Kolkata where passengers can book single seats at fixed rates and fly at particular charter timings. This is the first time in India that a “per seat “, fixed cost, fixed schedule, chartered air service connectivity is offered for industrial cities like Jamshedpur and Rourkela. “Business travellers from now can expect to travel in style and comfort of modern charter planes from Jamshedpur to Kolkata, attend work and return back the same day,” an official said. Jamshedpur debuted on the country’s air map in 2007 with Air Deccan linking the city to the Bengal capital, but the service ended soon. Then, MDLR Kingfisher resumed connectivity in 2009, but only for a few months. On August 17, 2010, Deccan Charters hired a turboprop 19-seater aircraft with a fare of Rs 5,000, but services ended in February 2011. “DTDS charter flight timings connect morning flights reaching Kolkata from Bangalore, Mumbai, Chennai, New Delhi so travellers to Jamshedpur and Rourkela from anywhere in India or abroad can reach destinations in the shortest time and catch connecting evening flights back home,” the official further noted. DTDS offices are available in Kolkata, Bangalore, Rourkela and Jamshedpur. Bharat Vasani, secretary, Singhbhum Chamber of Commerce and Industry, said that the people of the city will be immensely benefited due to the service and this would spur a renewed phase of growth. “It will give boost to industrial development of the State of Jharkhand. I also wish success to the move,” he noted. Meanwhile, in the wake of rail traffic on Howrah-Mumbai route getting affected owing to CPI (Maoist) violent activities on tracks and the National Highway-33 that connects the city to Kolkata, being under siege of dacoits at Lodhasuli jungles in West Midnapore district of Bengal, travellers, especially businessmen who frequent to Howrah, were left in a lurch and were awaiting the resumption of air service at the earliest. “The travel woes of executives and business class will be addressed to some extent, for we will at least have one option ready at hand to reach Howrah for business meetings and other engagements,” observed S N Thakur, industrialist and former president, Adityapur Small Industries Association (ASIA).